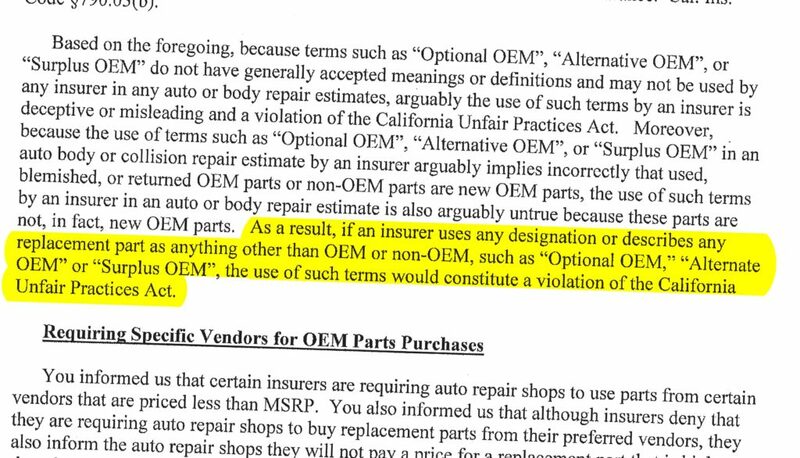 Following a California BAR regulation clarifying that nebulous parts classifications like “Opt-OE” shouldn’t appear on repairer estimates, the California Department of Insurance confirmed Monday that there’s no place for them on insurer estimates either. It would be an unfair claims settlement practice, CDI general counsel and Deputy Commissioner Kenneth Schnoll wrote to the California Autobody Assocation, which had sought a legal opinion on the behavior. 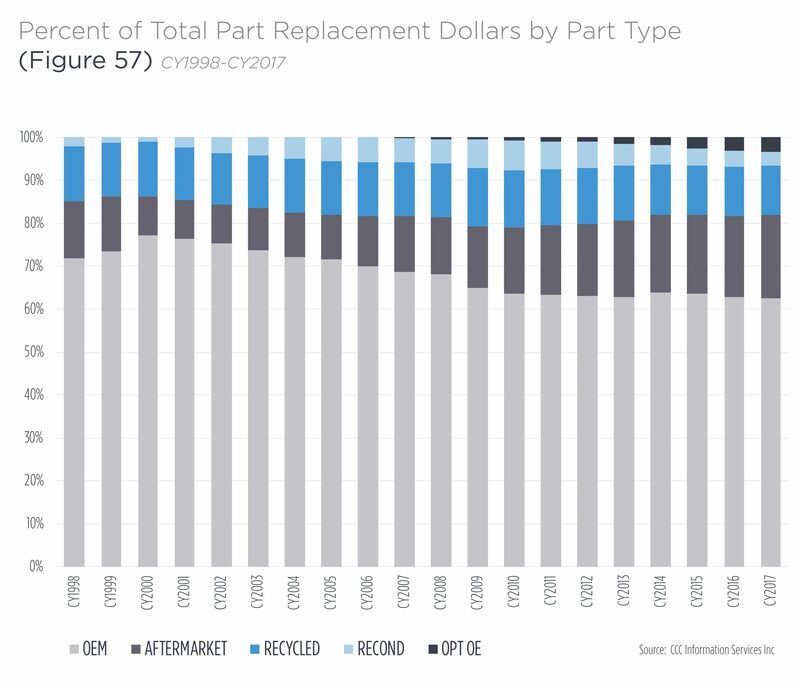 Under the California Code of Regulations, collision repairers must give customers a estimated price for parts and labor that itemized each component, and each part “must be new unless specifically identified as a used, rebuilt, or reconditioned part,” Schnoll wrote. Opt-OE parts are a concern because aside from a few formal programs by automakers themselves — selling parts which may or may not be warrantied — there’s no way for the customer to know what they’re buying. 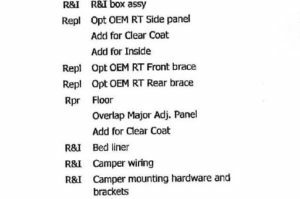 It seems to be whatever the vendor wants to declare “Opt-OE.” The part might be new, and acquired and resold at a discounted price. It might be new, but from another part of the world. The vendor might in good faith think they’re new — only to find out they’re counterfeits. In a situation where a body shop wrote an estimate on behalf of the insurer, it still counted as an estimate from an auto body shop — which meant the shop was still bound by the Business and Professions Code and California Code of Regulations, according to Schnoll. The shop working on behalf of the insurer still had to classify parts one of four ways — new, used, reconditioned or rebuilt — and say whether crash parts were OEM or aftermarket. “Accordingly, because insurers are required to follow the same standards as auto body collision repair shops in connection with repair estimates, insurers are also prohibited from using any description of any replacement part other than new, used, reconditioned, rebuilt, an OEM crash part, or a non~OEM aftermarket crash part,” Schnoll wrote. Schnoll also pointed out that insurers were bound by the California Insurance Code not to say anything “which is untrue, deceptive, or misleading, and which is known, or which by the exercise of reasonable care should be known, to be untrue, deceptive, or misleading.” Using terms like “Opt-OE” were at best misleading and at worst deceptive, he suggested. California shops interested in hearing more from the Bureau of Automotive Repair about collision repair should attend a public workshop Oct. 18, scheduled for 2 p.m., after its advisory board meeting at 9 a.m.